A special homemade treat for my buddy's 7th birthday! 1. Preheat oven to 350 degrees F. Line 6 wells of a standard muffin tin with paper liners, or spray with non-stick cooking spray; set aside. 2. In a medium bowl, whisk together the flour and baking powder. Add the vegetable oil, applesauce, egg and honey, and whisk gently to combine. Divide the batter between the prepared muffin cups and bake until a toothpick inserted into the center comes out clean, 10 to 15 minutes. All the pupcakes to cool completely before frosting and serving. 3. To make the frosting, stir together the yogurt and peanut butter, then spread on top of each pupcake before serving. 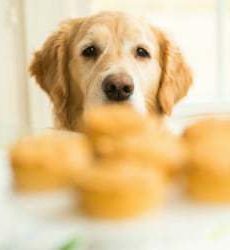 The pupcakes can be kept for up to 3 days in the refrigerator.